Posted on October 25, 2017 at 9:09 am. Our goal here at Amthor International is to provide the tank trucks that you need for your business. Because everybody’s business needs are unique, we not only provide an extensive selection of tank trucks but the opportunity to customize each one as well. 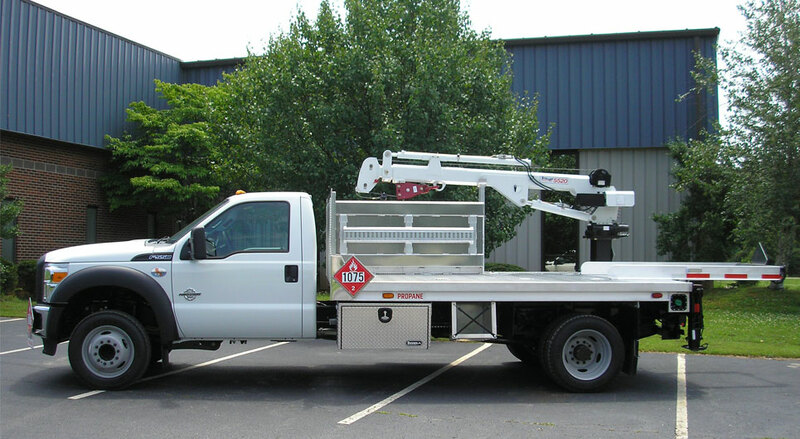 If your business requires vehicles that can transport small propane trucks, then we recommend our crane trucks. We know exactly what you’re looking for if you’re looking for trucks that can transport small propane tanks, whether the propane is for home heating, commercial heating or cooking purposes. You need something that prioritizes safety and efficiency. That is exactly what our crane trucks do. Our crane truck, which is also sometimes known as a boom truck and bottle body, is manufactured with a specially designed mobile crane that can pick up and move your small propane tanks wherever they need to be placed. The trucks themselves are built to be heavy duty and are made out of aluminum extrusions with a variety of different toolbox options with aluminum extruded doors. There are many options to choose from when it comes to customizing your crane truck so that it meets your specific needs. You’ll be able to choose from several different crane size options, each of which is designed from heavy-duty aluminum extrusions that can be further customized with different cabinet sizes, length options, and crane variations. Last but not least, you can purchase a crane truck from Amthor International as a complete installation on a chassis, or you can choose to have your next crane truck body shipped to you instead as a kit. For more information about our mobile crane trucks or to discuss what customization options are available to you, be sure to contact us at Amthor International today.